A photograph of Strawberry Plains in 1864, a valuable trading route during the civil war. The 1,600-foot structure across the Holston River at Strawberry Plains, Tennessee, was the scene of frequent skirmishing between the Federals and the Confederacy. 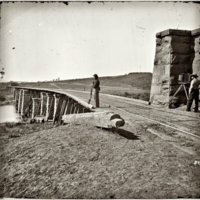 For more than a year, Colonel Thomas and his Legion guarded the bridge. It was destroyed and rebuilt four times during the war. This 1864 photograph was taken by the Federals and shows an earthwork fort in the background. Photo of Strawberry Fields (1864), Civil War Era NC, accessed April 24, 2019, https://cwnc.omeka.chass.ncsu.edu/items/show/318.